Still, I am willing to overlook the mishandling of my category, because I know that I should be the winner. I am adorable, expressive, and clearly the king of the animal kingdom. I have heard that there will be fights over who should win. That this could tear Odeck apart. I’m just saying that a vote for me is a vote for the Odeck to stay together, calm and happy. It will be the metaphorical toothbrush upon the Odeck’s head. So, before you go to war over which creature is better, stop and think for a moment. The answer is me! The cutest creature with the most expressive face. And, well, just as an added incentive, I don’t exactly handle losing well. Er. Jinxe is back. I’d better run. 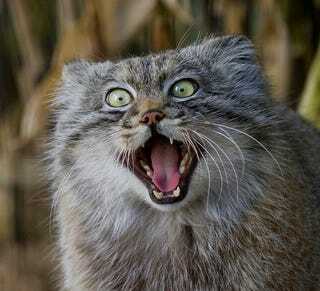 VOTE FOR ME, PALLAS CAT. I just can’t wait to be King.